Bacterial encroachment—shrinking of the bug-free zone adjacent to the colonic epithelium—is a feature of metabolic syndrome, researchers report in the September issue of Cellular and Molecular Gastroenterology and Hepatology. The findings could explain the relationship between diabetes and inflammation. Mucoid structures that coat the epithelium keep the intestinal microbiota at a safe distance from epithelial cells. Encroachment of bacteria into the almost-sterile inner mucus layer has been observed in patients with inflammatory bowel diseases (IBD), mice with colitis, and mouse models of metabolic syndrome. However, it has not been clear how the metabolic syndrome and inflammation are linked. 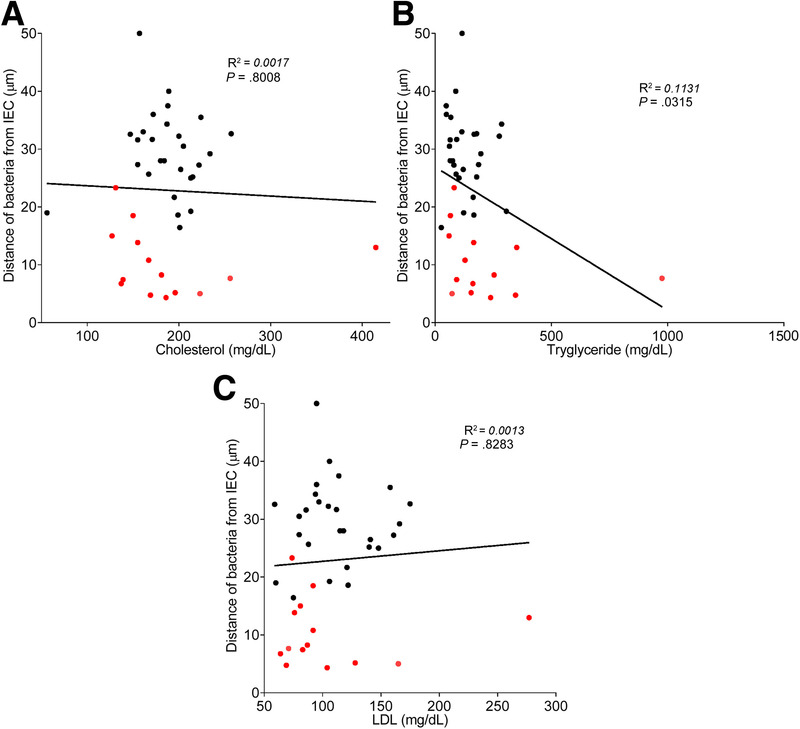 Benoit Chassaing et al investigated the relationship among intestinal epithelial cells, the microbiota, and metabolic syndrome in by analyzing mucosal biopsies from 42 individuals, 31 to 74 years old, undergoing colonoscopy for colon cancer screening. Most of the patients were overweight (86%), 45% were obese, and 14 patients (33%) had diabetes. Samples were analyzed by immunofluorescence staining paired with fluorescent in situ hybridization to analyze bacteria localization at the surface of the intestinal mucosa (see figure). 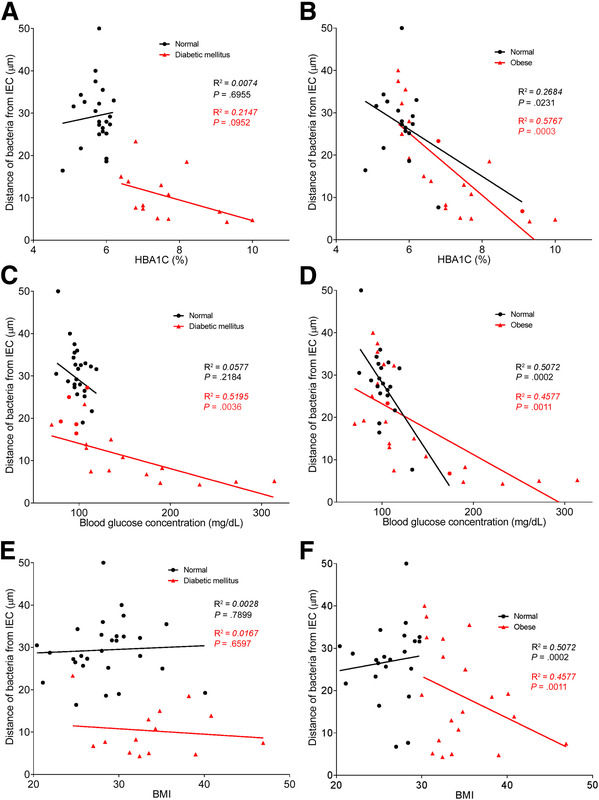 Chassaing et al found the epithelial–bacterial distance (the average width of the sterile mucus layer) to correlate inversely with body mass index, fasting levels of glucose, and levels of hemoglobin A1C. Interestingly, Chassaing et al found dysglycemia to be the only factor independently associated with bacterial encroachment. In comparing biopsies from obese patients with normal blood glucose vs non-obese (control) subjects, the authors did not find a difference in bacterial distance; they were therefore able to uncouple the effects of obesity and loss of glucose regulation. This had not been possible in mice, in which body mass index and dysglycemia are linked. The authors also showed that cholesterol level did not correlate with microbiota encroachment in patient samples. Chassaing et al propose that altered microbiota might promote low-grade inflammation by attaining greater proximity to the cells and receptors that detect and signal the presence of bacteria and their metabolites. 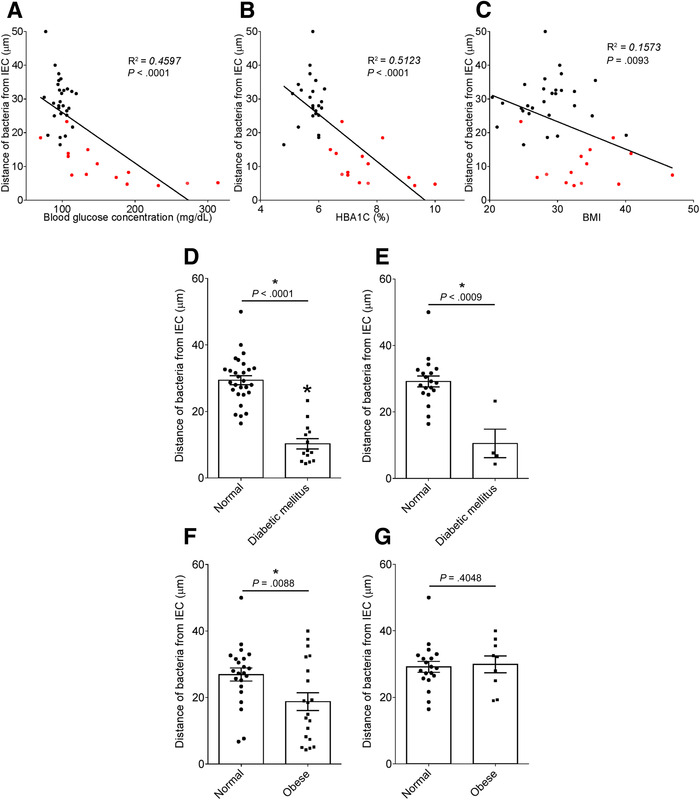 They previously observed bacterial infiltration into the mucus layer (microbiota encroachment) in mice that developed metabolic syndrome as a result of loss of the flagellin receptor TLR5, feeding of synthetic dietary emulsifiers, or obesogenic diets. In an editorial that accompanies the article, Mark R. Frey says that encroachment has been associated with human inflammatory bowel disease and observed in mice with colitis or metabolic syndrome, but that this study provides the first clear demonstration of the same phenomenon in patients with diabetes. Frey says that bacteria encroachment could be an important link between metabolic syndrome and associated low-grade inflammation. Chassaing et al reported an increased number of CD19+ cells (likely B cells) in the mucosal tissues from patients with diabetes, supporting a model in which bacterial encroachment contributes to the low-grade inflammation observed in patients with metabolic syndrome. 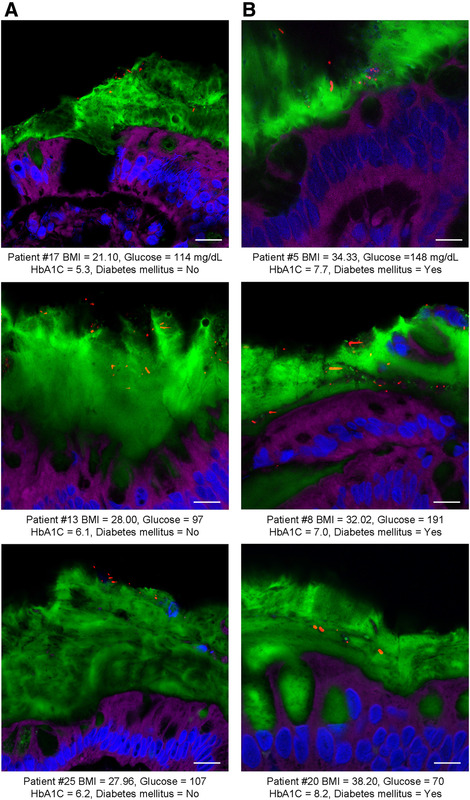 Chassaing et al ruled out the possibility that encroachment was due to increased levels of blood glucose promoting bacterial proliferation, because mice given injections of streptozotocin, which which destroys insulin-producing beta cells and causes obesity-independent increases in blood glucose, did not cause encroachment. Studies are needed to determine whether the altered microbiome and narrowed sterile layer above the epithelium initiate low-grade intestinal inflammation in patients with metabolic syndrome. Bacterial encroachment could be a mechanism of some of the inflammatory effects of dietary emulsifiers, which Chassaing et al have previously shown to promote encroachment and colitis. Studies are needed to determine the mechanisms of the encroachment and the clinical relevance.